Spirit of SOTM | NJNA is Blogging! I’m sitting in California at my Mom’s and was so upset to miss the first meeting of the SOTM subgroup. So I took out my canvas and joined you in spirit. 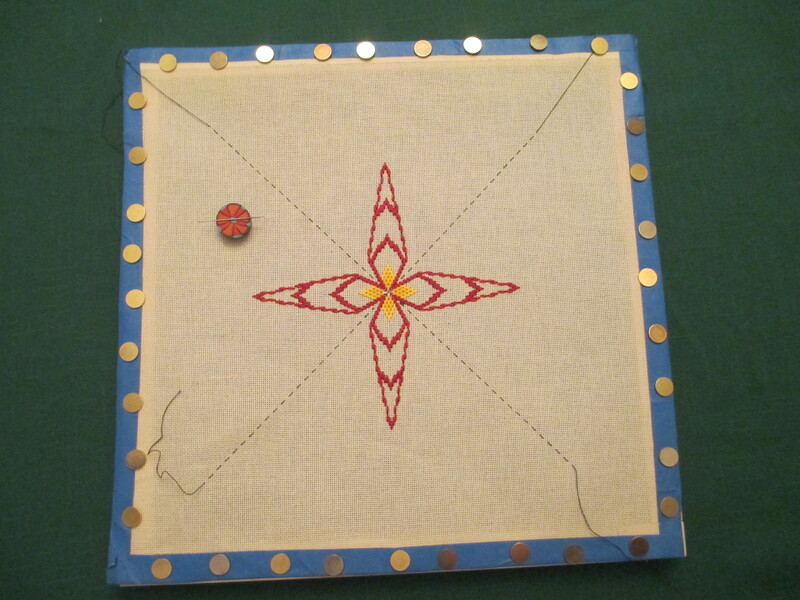 I am eager to hear how today’s stitching went and to learn how much progress everyone made. I didn’t quite get through February’s assignment — let alone get started on the new March stitch! So, the photo shows my progress at the end of the SOTM stitching day — I do hope others will share their progress and colors with us via the blog! I miss all of my stitching buddies! So glad you were able to stitch on the SOTM project. We definitely missed you yesterday – it didn’t even occur to me to take pictures! See you next month.